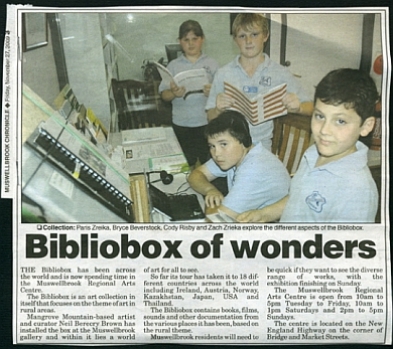 Bibliobox was presented in conjunction with an exhibition by the Williams River Valley Artists Project. Date: 18th - 29th November 2009. The Williams River Valley Artists Project consists of artists making work in relation to a series of residencies on a dairy farm in the Williams River Valley, where valuable and productive agricultural land will be inundated with the controversial building of a water storage dam. As a consequence generations of local culture will be destroyed. The project consists of a work by a collective of 9 artists including Suzanne Bartos, Neil Berecry-Brown, Bonita Ely, Noelene Lucas, Bridget Nicholson, Margaret Roberts, Toni Warburton, David Watson and the initiator and curator, Juliet Fowler Smith. It was formed to enable artists to add to the growing resistance to the government’s plans, to raise awareness of the need to protect the Williams River, and preserve its unique heritage, community and productive agricultural land. Another goal was to enable artists to use art-practice to bear witness to the process of this particular struggle. The artists used dialogical research processes and personal involvement to learn about the social, cultural and environmental implications of destroying place-based communities, i.e. communities that are formed through a common commitment and identification with a particular place. 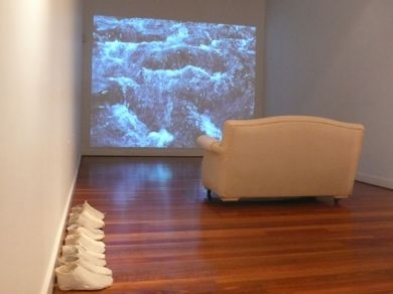 The project is multifaceted with residencies and meetings with local people, and a cumulative and evolving series of exhibitions at regional art centres, cumulating at the University of Sydney in October 2010. 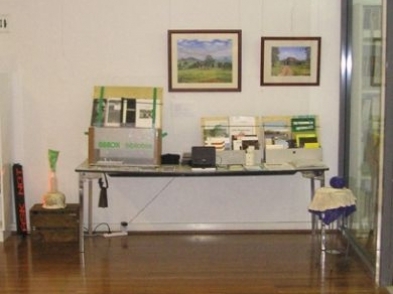 Consistent with the Bibliobox’s character, as a rolling stone that gathers moss, work from the Mangrove Mountain Country Fair by Sharyn Walker and Tricia Flanagan were displayed at Muswellbrook, as well as documentation of the Mangrove Mountain Districts Country Fair. Image#1(above left): Muswellbrook Installation. Image #2 (above right): Williams River.